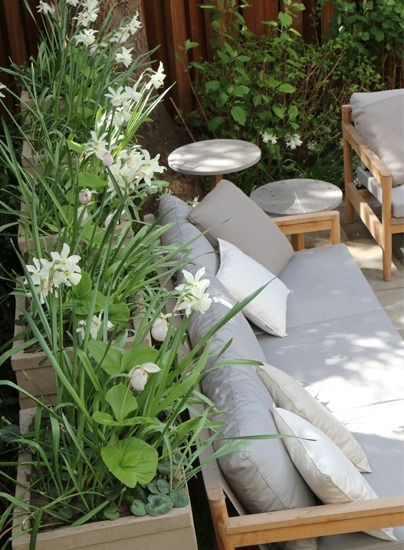 Here at the studio our aim is always to create elegant spaces, while acknowledging the natural shapes and colours to be found in wild grasses, flowers and foliage. 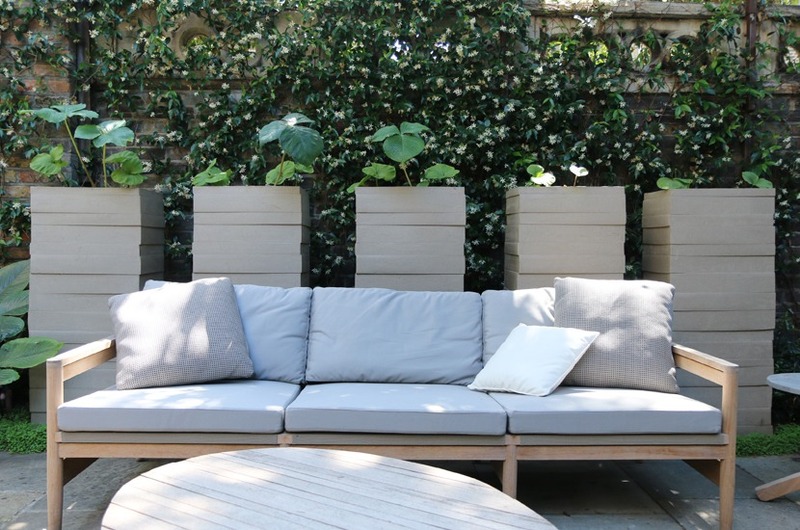 In other words, we give special thought to selecting pots, planters and other artifacts that will help us to create this balanced environment by cleverly containing the wildness of nature within the refined boundaries of modern elegance. 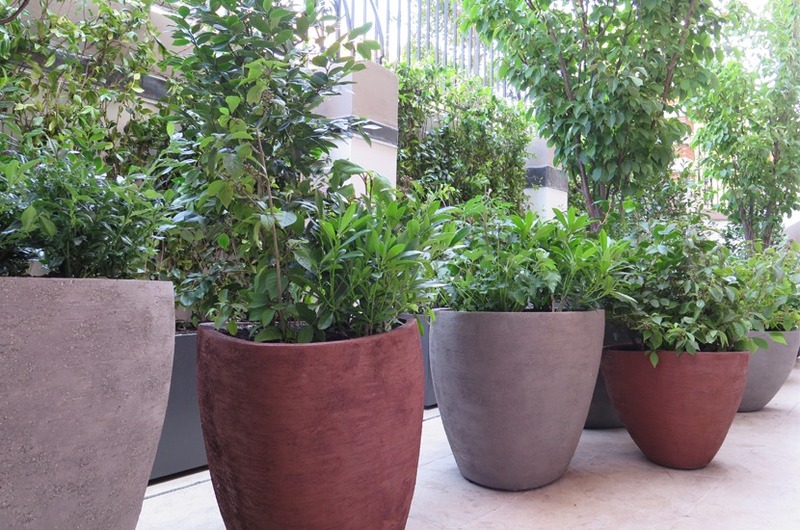 We often use terracotta pots of different colours and textures, combining them in a way that makes a clear reference to the colours and style of the paving, furniture, and even to the colours of the plants in the beds. 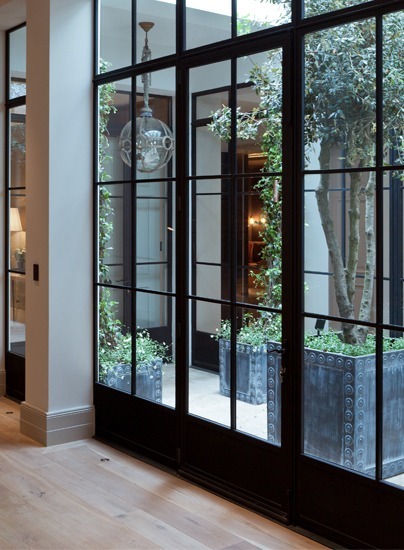 In Cresswell Place we used metal pots to match the metal-framed furniture. The pots were available in many different sizes, making them suitable for both perennials and shrubs. They gave us space for additional planting, and also brought an innovative design to the garden. 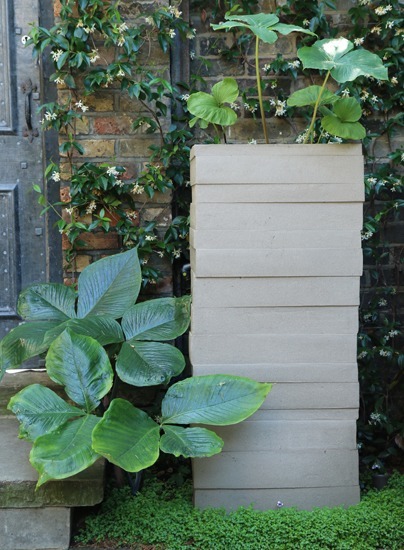 As in our other London gardens, we have made terracotta pots into architectural features in the garden. 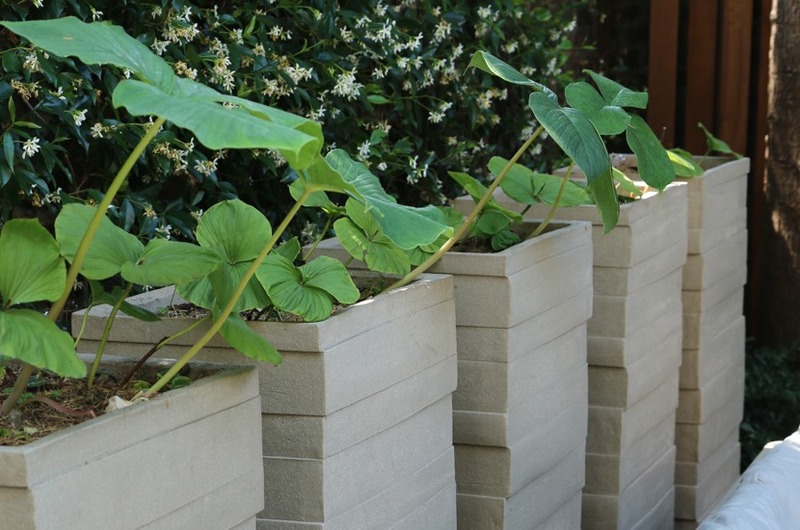 In this project we used rectangular pots to look like a row of columns, packing them with seasonal planting. This mesmerising effect was enhanced by the evergreen jasmine that covers the wall behind them. The handmade pots are marked with horizontal rings that create a pleasing contrast with the vertical lines of the fence. Pots are often works of art in themselves, and when they are overflowing with flowers they add special appeal to the overall concept of a garden in each and every season. 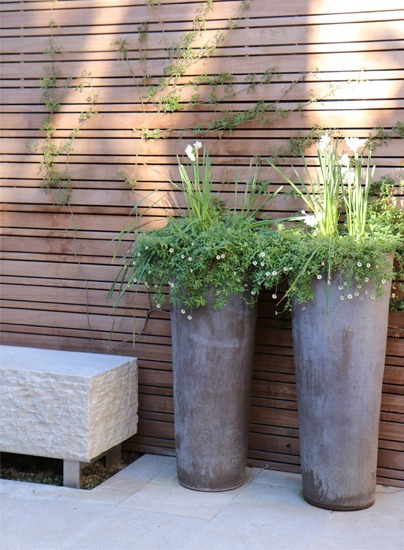 We would like to demonstrate a few examples of the planting palettes and pots combinations we have used here. As much as we like to create unique planting arrangements, we are also equally happy to recreate elegant formality by the use of classical arrangements such as Buxus balls in a garden. 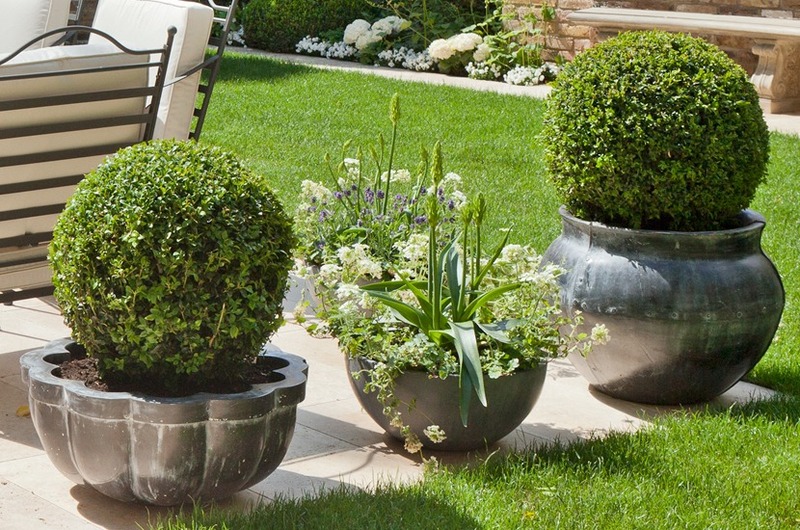 Buxus is a standard choice to stand neatly in tall or short terracotta, fibreglass and metal pots. 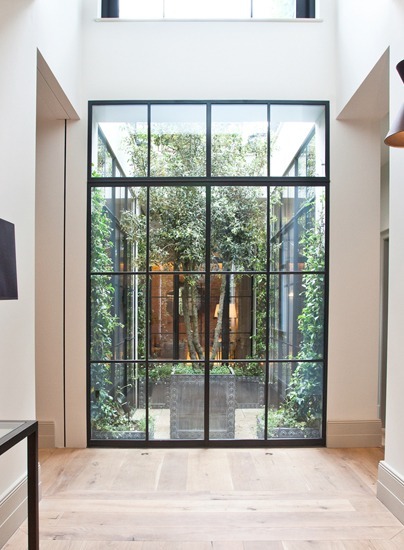 This use of a single evergreen throughout a planting scheme adds a clean elegance to the overall concept. In our first Alexander Square garden, we are delighted to demonstrate a palette of planting that evolves gradually through every season. 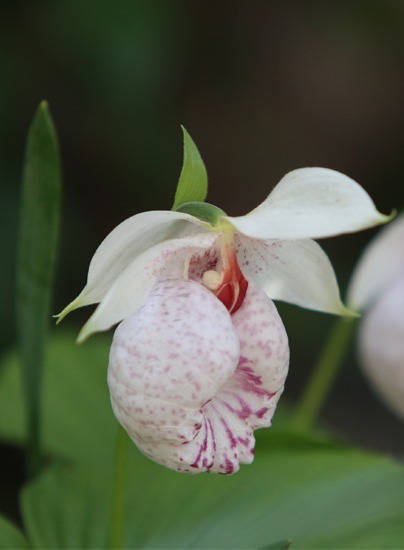 As the earliest flowers of the year, the snowdrops give way to a display of Cypripediums. 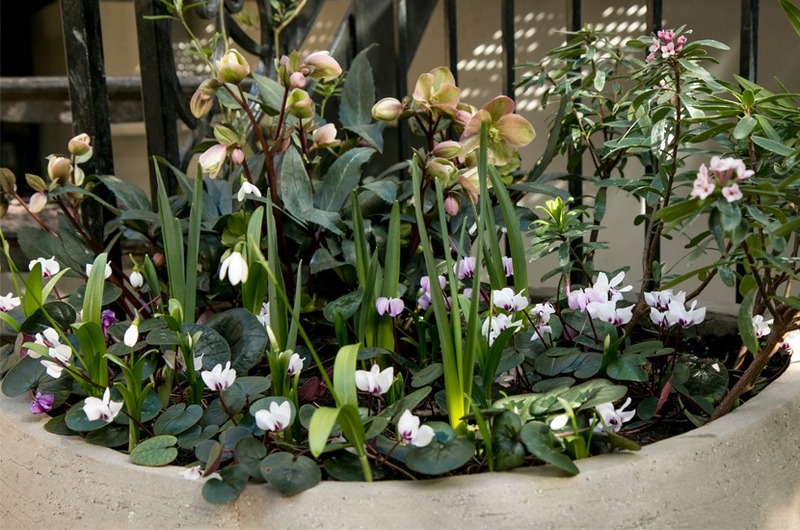 The other plants which are planted in the pots are: snowdrops, Cyclamen coum, Hellebores, Narcissus. 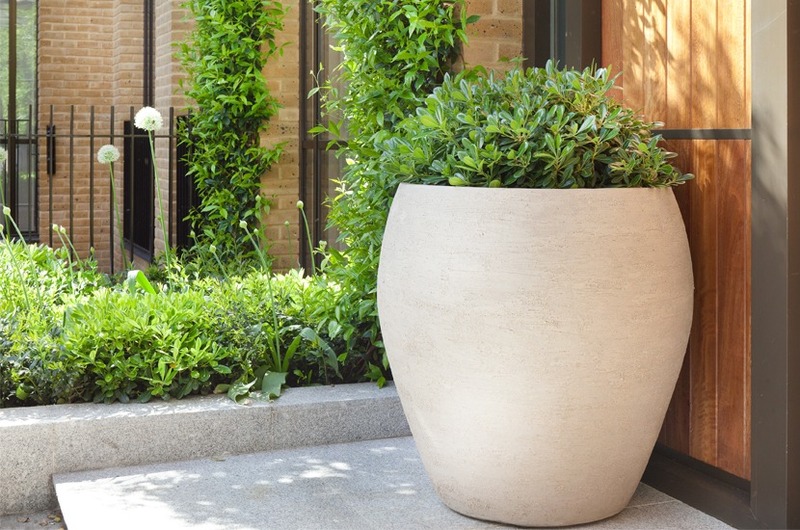 In this garden we have teamed up white Atelier Vierkant pots with Pittosporum tobira ‘Nanum’. This variety of Pittosporum is a lovely flowering compacted shrub with evergreen variegated leaves that marry well with the pale, shade of the pots. We think it a particularly good choice when only a gently contrasting variegation is required. 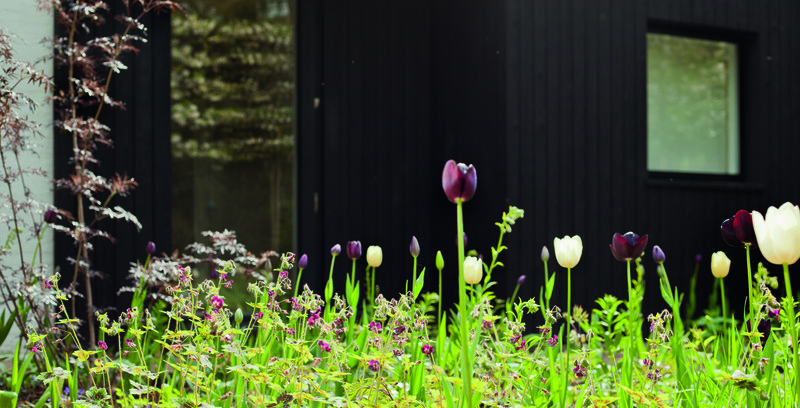 It is quick and easy to grow, and in this combination it has brought formal elegance to the garden. 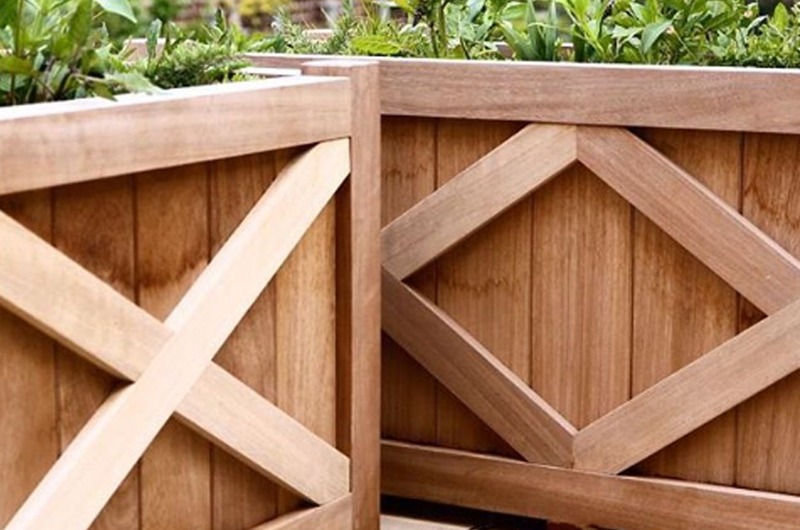 These wooden planters are a departure from the traditional townhouse look, creating a contrast with the overall theme of the design at the front of the property. 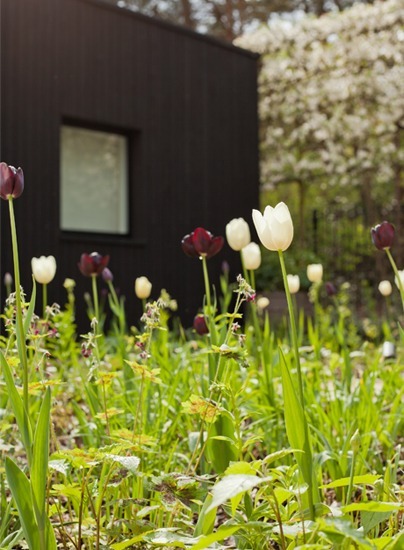 The same planters are used in the back garden, linking gardens on the two sides of the house. They are all packed with perennials to provide year round interest. 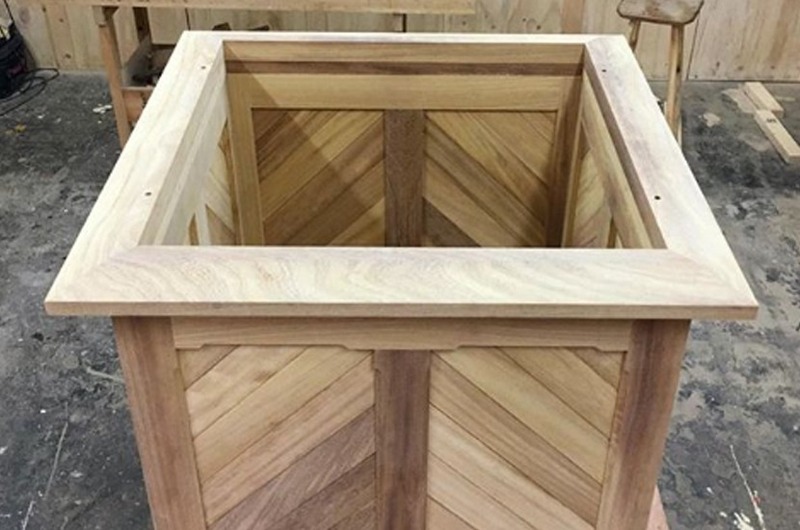 This timber planter was built by our contractor to match the existing planters at the property. It is a particularly good example of our skill in matching old and new. Dierama and Erigeron create a simple but beautiful combination in pots. This cascade of Erigeron marries particularly well with the terracotta texture of the pots. 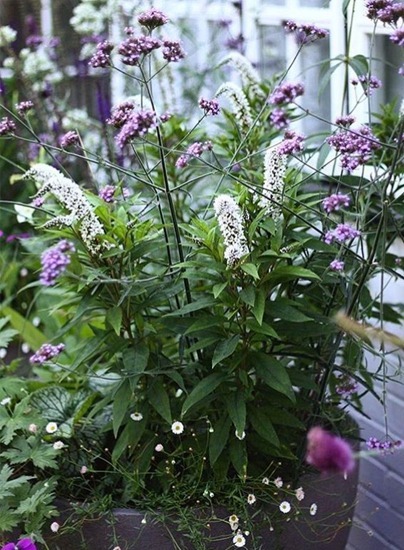 Three of our favourite perennials for late seasons interest: Verbena bonariensis planted in pots with Lysimachia cletroides and Erigeron karviskianus. 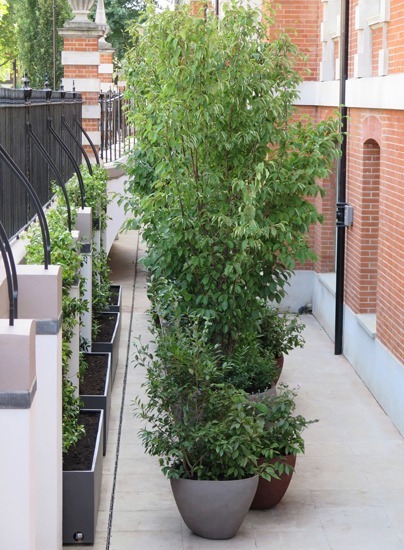 Trees and shrubs used with climbers planted in organic shaped terracotta pots to decorate the front basement courtyard of this new development in Chelsea. The green canvas was created for the residents of this historic building over 100 meters long which has been converted into an exclusive development of sixteen luxurious apartments and one villa. 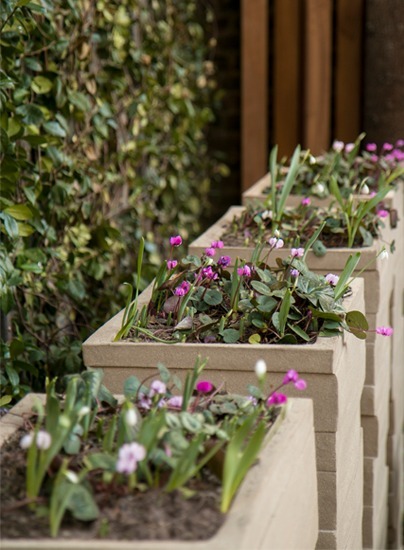 These pots have been selected to sit well with the black walls of the new extension. 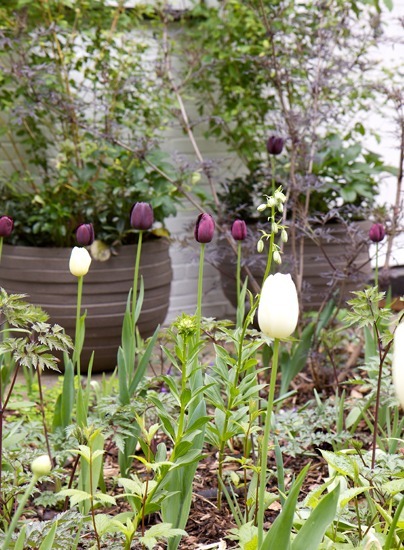 We have continued the dark theme by planting ‘Queen of Night’ tulips in the planting beds in front of the pots.